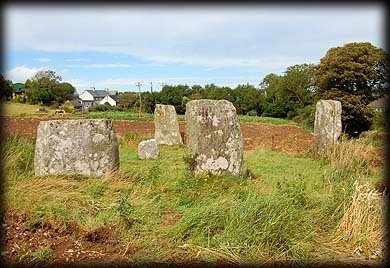 All that remains of this recumbent stone circle are four tall flat topped stones that include the recumbent and a fifth stone that is almost down. At the centre of the circle which was originally 9.5 metres in diameter sits a large lump of quartz, which seems to be quite common to stones circles around this area of Cork. See also Reanascreena. 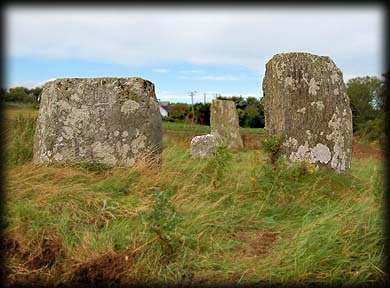 All four remaining standing stones are in the eastern half of the circle including one that may be a portal stone. It is not known how many stones originally made up this circle, in 1743 nine stones were standing, but by 1837 only the five we see today remained. The tallest of the stones is about 2 metres. The quartz stone at the centre of the circle is known as "Cloich Griene" meaning the sunstone. This is said to be from where Clonakilty got it's name. I found the landowners very friendly and most helpful so please ask before visiting. If you do call then visit the nearby ogham stone. 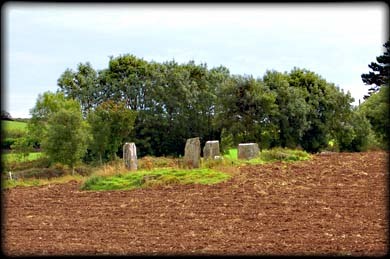 Situated: From Clonakilty take the Ballinascarty road, after about 2 1/2 kilometres just after a left turn you will see one of the stones standing above you in the field to your left. There is a stile in the wall. The owners are at the next farmhouse on your left. Discovery Map 89: W 3885 4376. Last visit Sept 2006.